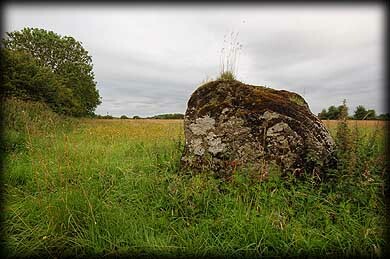 This standing stone is situated about 100 metres south of the Lios stone circle at Lough Gur. 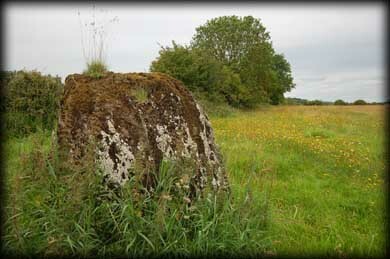 It is believed to be part of a giant spirit tree that exists beneath Lough Gur. I am not sure where this myth originated, but the Celtic tree of life represented strength, wisdom and long life. It was also a connection between the earth and the spirit world. From a distance the stone could easily be mistaken for a tree stump. You can see part of the stone circle in the background of the top image. Situated: From Bruff take the R512 North about 1 kilometre after the first crossroads you will see a small car park on your right. At the Stone Circle walk south to the gate in the hedge. the stone is through here on the left. Discovery Map 65: R 6327 4036. Last visit July 2011.